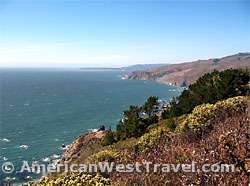 From Marin Headlands heading north, the Golden Gate National Recreation Area hugs the coast along California Highway 1 through Muir Overlook, Rocky Point, Stinson Beach, and Bolinas Lagoon. It continues east of Highway 1 along the Bolinas Ridge and finally a small section at the head of Tomales Bay. Muir Beach and Muir Overlook. Look for the turnoff to Muir Beach as the Shoreline Highway winds down to the bottom of Green Gulch and approaches the coast. The secluded beach sits in a cove with steep bluffs on either side. There is a developed picnic area, and the sandy beach is good for walking and beachcombing. A small lagoon behind a sandbar is good for bird-watching. Leashed dogs are permitted on the beach. Swimming is not recommended. The small town of Muir Beach is just north of the beach. Muir Overlook sits on a high bluff where Highway 1 reaches the coast. In good weather the overlook offers spectacular views of the coast looking both north and south. There are several short trails going out to the edge of the bluff with even more exciting views. It may not be suitable for those uncomfortable with heights. There is a picnic area but it has no shelter from the frequent stiff winds. Slide Ranch. North of Muir Overlook, Slide Ranch is a nonprofit working ranch designed for the education of young people. Visitors may check out the ranch's gardens, hiking trails, beaches, and fascinating tidal pools. There are also formal programs. Recommended for families with younger children. Rocky Point is a headland which juts out of the coastline offering magnificent views. Steep Ravine descends from Mt. Tamalpais and reaches the ocean next to Rocky Point forming a small beach. The Steep Ravine Trail east of the highway offers excellent hiking. Mt. Tamalpais State Park manages both cabins and campsites on Rocky Point. They are very popular and available by reservation only. For more information, please call (415) 388-2070. Stinson Beach. The three-mile long sandy beach marks the end of the cliff line running north from Muir Overlook. The comfortable beach and the small community adjacent has long been a popular getaway for Bay Area residents. Stinson Beach facilities include rest rooms, showers, picnic areas, BBQ grills, and a snack bar which is open during the summer. Dogs are permitted only on the north end of the beach run by the county. Services are available in Stinson Beach. Bolinas Ridge. This high ridge provides scenic views of the coast nearly 1,400 feet below. The Bourne Trail climbs the ridge from the Audubon Canyon Ranch (see below). The Bolinas Ridge Trail climbs towards Mt. Tamalpais from Sir Francis Drake Boulevard. Bolinas Lagoon. The lagoon is a tidal estuary sitting behind the Stinson Beach sandbar at the north end of the beach. This wildlife preserve features a great variety of birds. Harbor seals and their pups may be seen in spring. The sandbar is a private community and not accessible. There are pullouts on Highway 1 which goes to the right of the lagoon. Bolinas Park in the village of Bolinas offers access on the far side of the lagoon. To access, turn west on Olema Bolinas Road just north of the lagoon. Audubon Canyon Ranch. This private wildlife sanctuary on the east side of Bolinas Lagoon was originally founded to protect egret and heron nesting colonies. Beside a wide variety of birds, many mammals and other animals are found on the ranch. There are 8 miles of hiking trails on the property. Admission is free, but donations are requested. Open late March to early July, weekends and holidays, 10am-4pm, Tuesdays through Fridays, by appointment.